You may have noticed that the Oshman Family JCC was closed on Friday, August 26. If you were wondering why, the answer is simple: preparedness. Many people are vaguely aware that an emergency disaster situation is possible but few of us have taken concrete steps to prepare for it. Friday, August 26 at the OFJCC was dedicated to making sure the campus is prepared to safely evacuate and protect members and staff in the event of an emergency as well as to sharing our common mission as an agency. Kenneth Dueker, Director of Emergency Services for the City of Palo Alto, provided information on how to best prepare in the event of disaster. Dueker noted that a high magnitude earthquake has more than a 99% chance of happening in California in the next 30 years, according to the U.S. Geological Survey. In the event of a disaster, there is also the possibility of a “cascading effect”–the impairment of phone systems, infrastructure, roads and water delivery. Unfortunately, no police department has the capacity to serve all of the residents in an urban area at the same time during an emergency. As a result, professionals recommend that each individual and family prepare independently. In the event of an emergency, the basic essentials might not be available from stores and utilities. For this reason, the City of Palo Alto recommends assembling a kit of supplies needed for survival. Surprisingly, the kit should contain enough provisions to last at least seven days. This includes basics like nonperishable food, water, toilet paper and a flashlight but also less commonly thought of items such as comfortable clothing, sturdy shoes, cash in small bills, a tent, sleeping bag, flash drive with important documents and a battery solar crank radio preset to an emergency radio station. More information on local tips for creating a kit can be found here. Planning for a disaster is an important element of being prepared. FEMA has a handy Family Disaster Plan document which can be filled out for each individual or family. In the event of an emergency, it is important to stay up-to-date on developments in the area. The City of Palo Alto recommends registering for AlertSCC as the best way to stay informed in the event of an emergency. This county-wide service ensures that you receive emergency alerts about critical and timely safety information throughout the course of what is happening. There are also two radio stations to be aware of in an emergency and those are KZSU 90.1 FM (Local) and KCBS 740 AM/106.9 FM. 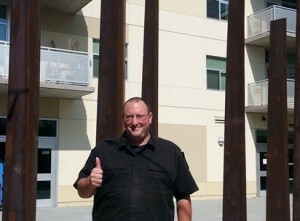 Sergeant Dueker gives the thumbs up in front of the 12 Tribes Sculpture at the Oshman Family JCC. 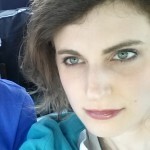 Andrea Longini calls herself the Communications Manager at the OFJCC. She also calls her family long distance in Pittsburgh and her in-laws even longer distance in Belgium. She believes part of living fully is staying in touch with people you care about. An example of how this can be done is by sending them links to meaningful blog posts. Now that's what she calls communicating!